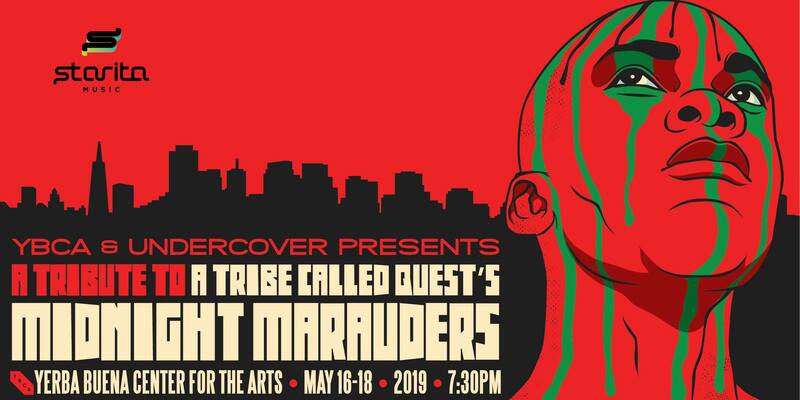 UnderCover Presents is honoring A Tribe Called Quest’s Midnight Marauders, an album that bridged the gap between hip-hop and jazz. The show takes place May 16-18, at Yerba Buena Center for the Arts. Given that both YBCA and this album celebrated their 25th anniversaries, UnderCover felt it appropriate to continue to introduce this classic record to new audiences. Not to mention that the messages embedded in this album continue to echo resoundingly as we witness all that is taking place in the world. With this tribute, UnderCover aims to reflect the spirit of Midnight Marauders by incorporating elements from all four pillars of hip-hop: DJing, MCing, Writing (graffiti) and B-Boying (breakdancing), along with the minimalism and free-forming nature of the jazz instrumentation. The institutionalized racism and classism that A Tribe Called Quest was grappling with when this album was released, is still being played out today, from border walls to prison bars. By hosting this tribute, we invite the audience to think about the way that hip hop (and this album, specifically) might break down these barriers and serve as a door to greater equality and unity. Starita is a 2-time GRAMMY®/Latin Grammy recognized producer, engineer and artist whose work spans a multitude of genres. Clients include Childish Gambino, A Tribe Called Quest, Third Eye Blind, Rebelution, Los Amigos Invisibles, Michael Franti and Spearhead and many others. Notably, Starita engineered the recent A Tribe Called Quest album ‘We got it from here….thank you 4 your service’ which reached #1 on Billboard’s Top 200 chart and earned RIAA Gold certification. He also engineered Laura Sullivan’s ‘Loves River’ which won the GRAMMY® for Best New Age and Los Amigos Invisibles’ ‘Repeat After Me’ which was GRAMMY® nominated for Best Latin Urban/Alternative and Song Of The Year in the Latin Grammy Awards. Starita recently released his own project in collaboration with artists Jarobi White of ATCQ, Trevor Hall, Trent Park, Madame Gandhi, Rituals Of Mine’s, Terra Lopez and, Mamel of Los Amigos Invisibles. He also served as President of The Recording Academy’s SF Chapter in addition to serving on The Recording Academy’s National Committees.